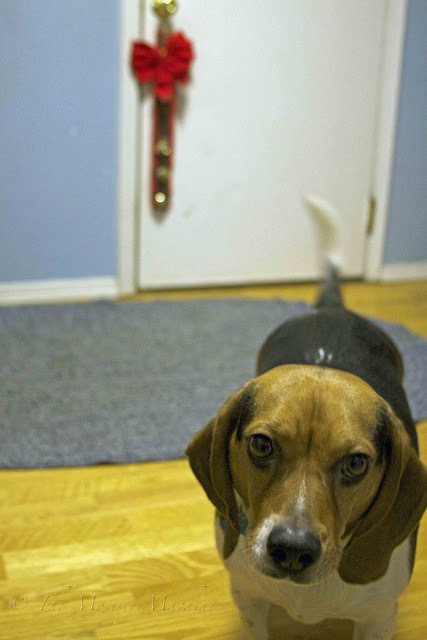 When we brought our 8-month-old beagle into our family, her previous owner assured us that Daisy was housebroken. Whether the owner stretched the truth or Daisy was so disoriented by her new environment that she couldn't find her way to the outdooors, the reality was that Daisy consistently did her business in the downstairs bathroom. And not in the toilet, if you know what I'm saying. I was grateful that at least the mess rained down on a linoleum floor that was easy to sanitize. My husband started from square one—kennel training—and eventually taught her to use the doggie flap at the back of the garage. We now just open the mudroom door, and Daisy knows where to go and what to do; she is the proud owner of a fenced area where she is free to christen every blade of grass, if you know what I'm saying. The problem is that when Daisy has to go, she sits quietly in front of the mudroom door. She doesn't whine. She doesn't scratch. She doesn't even wiggle. If noone in the family notices her sitting there, she'll go find someone . . . let me re-phrase that . . . she'll come find me or my husband. The kids are absolutely oblivious to the dog's subtle pleas, which consist mainly of a pair of baleful eyes staring silently up at you. She'll blow out your eardrums barking at a passing moose, but I guess she's too shy to announce that her bladder is full. I have been known on occasion to hyper-focus, and should I be concentrating on something other than the dog, she will finally give up staring silently at me and go into the downstairs bathroom to relieve herself. And, again, I shall emphasize that she doesn't use the toilet, IF YOU KNOW WHAT I'M SAYING. Christmas is the season of miracles, and one occurred in our household last month. In a moment of good cheer, I hung a strand of jingle bells on the knob of the mudroom door. Every time a family member went through, the bells would tinkle merrily. Well, turns out Daisy Doodle isn't as dumb as she pretends. That crazy beagle started lifting a paw and jingling those bells every time she needed to take a break. At first, I thought it was a coincidence. Maybe she sat a little too close to the door and accidentally hit the bells. NO! She consistently ambles to the door and deliberately rings those bells. POTTY TIME! Looks like those Christmas bells will be hanging year-round. Looks like Daisy has trained you well! Whatever works, I always say. Nice to see you again! Missed you over the past 9 days, but who's counting? Every day I look for a new post from you. But hey, no pressure. We recently acquired a cat who likes to throw litter around like confetti and who also, whenever she gets stressed out by the noisy kids, goes upstairs and relieves herself on any piles of dirty laundry she can find. If she keeps it up, she'll soon be un-acquired. Re: Kathy G - OR you could just get a series of ribbons. Oh, yes, we've always used bells for our dogs. A friend of mine told me about it, and we taught our first puppy to "nose the bells" with her snout when she wanted out. We're now on our third bell-trained dog. And the nice thing is, if we travel and take the dogs we can just take the bells with us and hang them on a doorknob where we are. Easy-peasy! I did get tired of the Christmassy look pretty fast, and bought sleigh bells on leather attached to a big brass ring. What a cutie! They always are smarter then they pretend. Visiting from SITS. The previous owners of my new dog assured me the same thing. LIARS. Only mine wont' go in the bathroom. She goes under the dinner table, on the playroom rug, in front of my washing maching, etc. I even hung bells by the door on purpose. Mine apparently doesn't figure things out as quickly as yours does. Stinkin dog. That's how we potty trained our Mini Schnauzer! After a month or so we were able to take the bells off and now he whines and paces UNTIL WE LET HIM OUT! In the past 4 months he has only had ONE ACCIDENT!!!! Our dog (a toy poodle) doesn't let us know when he needs to go out and almost never potties inside. He just waits until we ask him if he wants to go out, then he comes to us from wherever he was and waits to be put on his leash.